The Classic Colonial-Style Hacienda features suites that encircle a Tranquil Garden rich with plants, flowers and the sound of birds playing in The Hacienda fountain. The Hacienda San Miguel is located Downtown San Miguel, close to but just far enough away from the main square to assure quietness and safety for our client, and just half a block away from the ocean. 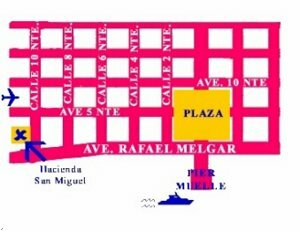 We are located downtown, 1/2 block from the oceanfront and close to shopping and restaurants call 10 Norte between 5th Ave and Rafael Melgar. All our clients receive the most personalized attention in familiar atmosphere, and concierge service from 7am to 11pm. Beautiful small studio with queen bed. 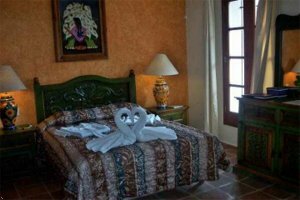 Each unit is decorated with rustic Mexican wood-carved furniture. Kitchenette includes refrigerator, freezer, stove/oven, and utensils. Also has coffeemaker, cable TV with remote control, air-conditioning, purified bottle water, continental breakfast served to your room, and amenities such as bathrobes, private bath with shower and hot & cold water. Breakfast nook. From the airport, take right on Airport Blvd. Turn left on 15th Ave and left on Calle 10 and before getting to the waterfront you'll find the Hotel Hacienda San Miguel. From the airport, take highway south to Playa del Carmen to board the ferryboat to Cozumel Island. Once you arrive to Cozumel, take north on the waterfront street 5 blocks you'll find Calle 10 Nte. Next door south to the property. 7 miles east to the property. 6 miles south to the property. 19 miles south to the property. 10 miles south to the property. 5 blocks south to the property.